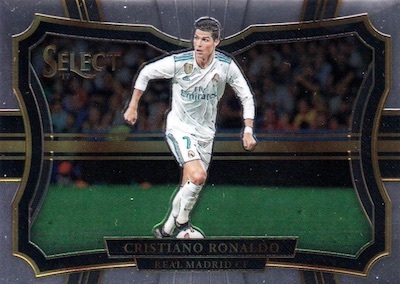 Covering the action from club or country, 2017-18 Panini Select Soccer works with Prizm technology and some interesting designs as it enters its third season. 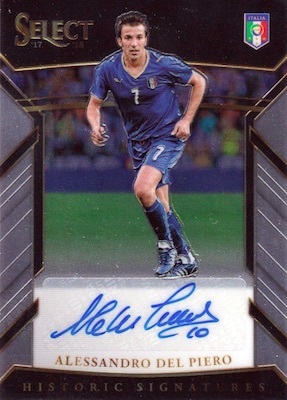 Hobby boxes contain three autograph or memorabilia cards from top players around the world. 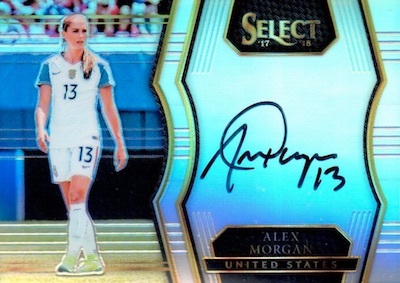 Sure to delight collectors, the 2017-18 Panini Select Soccer checklist offers the brand debut of on-card signatures. The 2016-17 set had three hits per box, as well, but only sticker autographs. One thing that hasn't changed is the '17-18 Select Soccer base lineup. Three different 100-card subsets combine to form a massive set of 300 cards. The base Terrace is the most common, followed by Mezzanine and Field Level, which is the rarest at roughly two per box (or 1:6 packs). Some parallels apply to all three options, like the new Zebra (#/25), or are exclusive to one format, such as the Maroon (#/199) and Fuchsia (#/125) for Terrace cards, and Pink Die-Cut (#/60) for Mezzanine. 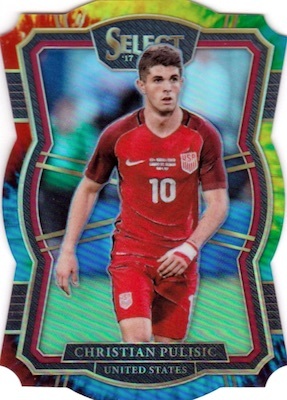 Also averaging two per hobby box, the 2017-18 Panini Select Soccer inserts alternate from the base style to popular lines from other sports. Resembling the main look are the Equalizers, for the top scorers, and Unlimited Potential, which identifies rising stars. Top of the Class offers another option centered around global standouts. These inserts have Camo (#/25), Gold (#/10), Green (#/5), and Black (1/1) parallels. Much more unique, the popular NBA set Kaboom! 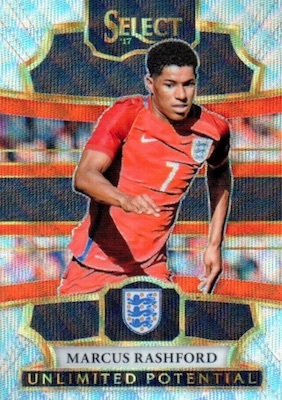 debuts on the pitch with a bright design and comic-book player art. 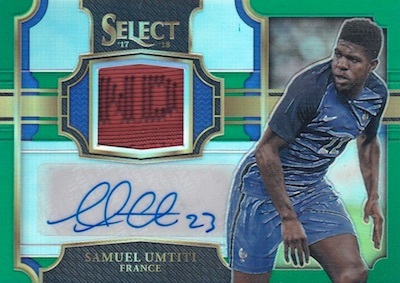 Taking center focus among the hits, 2017-18 Panini Select Soccer autographs are led by hard-signed Select Signatures. Incorporating a memorabilia swatch, the Jersey Autograph set provides some of the biggest names in the world, including Messi, Neymar and Ronaldo. With at least one per hobby box, relics include Sparks, X-Factor and Double Team Memorabilia, which highlights teammate pairings. PARALLEL CARDS: Silver, Checkerboard, Multi-Color, Blue #/299, Maroon #/199, Fuchsia #/125, Orange #/75, Tie-Dye #/30, Zebra #/25, Camo #/20, Gold #/10, Green #/5, Black 1/1. PARALLEL CARDS: Silver, Checkerboard, Multi-Color, Light Blue Die-Cut #/249, Purple Die-Cut #/149, Pink Die-Cut #/60, Tie-Dye Die-Cut #/30, Zebra Die-Cut #/25, Camo Die-Cut #/20, Gold Die-Cut #/10, Green Die-Cut #/5, Black Die-Cut 1/1. PARALLEL CARDS: Silver, Checkerboard, White #/99, Copper #/49, Tie-Dye #/30, Zebra #/25, Camo #/20, Gold #/10, Green #/5, Black 1/1. 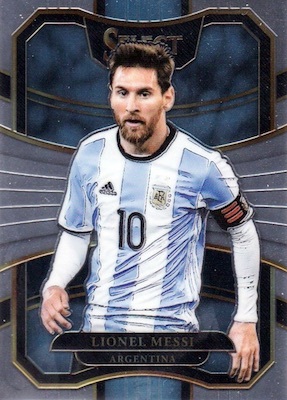 PARALLEL CARDS: Gold #/10, Black 1/1 (No Alvaro Morata, Carli Lloyd, James Rodriguez*). 63 cards. Shop on eBay. PARALLEL CARDS: White #/99 or less, Copper #/49 or less, Tie-Dye #/30 or less, Gold #/10 or less, Green #/5, Black 1/1. PARALLEL CARDS: Maroon #/199, Orange #/75 (No card #17*), Tie-Dye #/30, Gold #/10, Green #/5, Black 1/1. 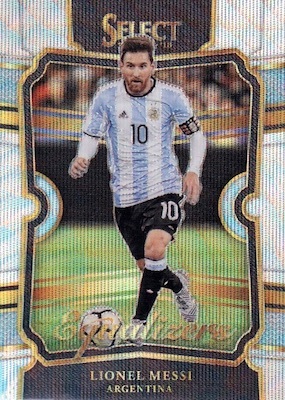 PARALLEL CARDS: White #/99 or less, Copper #/49 (Pele, Luis Figo, Diego Maradona - #/20*), Tie-Dye #/30 (Pele, Luis Figo, Diego Maradona - #/15*), Gold #/10, Green #/5, Black 1/1. 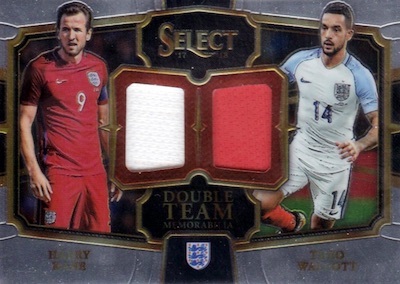 PARALLEL CARDS: Maroon #/199 (No Christian Ronaldo, Giovani Dos Santos*), Orange #/75, Tie-Dye #/30 (No Harry Kane; Ronaldo - #/15*), Gold #/10 (Ronaldo - #/7*), Green #/5, Black 1/1. 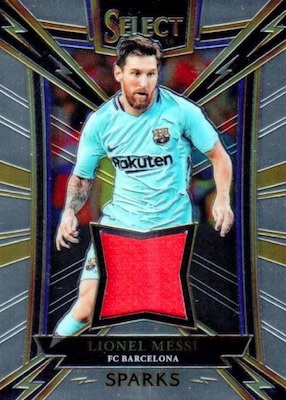 PARALLEL CARDS: Maroon #/199, Orange #/75, Tie-Dye #/30 (Ronaldo - #/12, Messi - #/15*), Gold #/10 (Ronaldo - #/7*), Green #/5, Black 1/1. All subjects not included in Maroon, Tie-Dye parallels. View specific options with the spreadsheet. Love the quality of card along with the options of collecting the entire set. Daughter is also HEAVILY into soccer and the addition of the women players makes this something she is interested in as well. Exceptional value for money with current and legendary players. Great for set collectors as well. Only request would be to separate the case hit and kaboom card from the same box…. 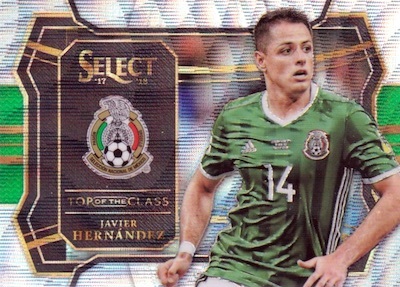 2017 18 PANINI SELECT SOCCER HOBBY BOX - 3 AUTOS MEMS PER BOX!